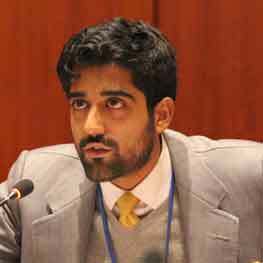 Ajay Madiwale works for the International Federation of Red Cross and Red Crescent Societies in Geneva, where he leads IFRC’s work on localizing humanitarian aid and engagement with key Multilateral Institutions such as the World Bank. Previously, he was based in the IFRC Delegation to the United Nations in New York, where he represented IFRC during the negotiation of the 2030 Agenda and Sustainable Development Goals, Financing for Development, and on issues of Migration and Forced Displacement. Before joining the Red Cross Red Crescent Movement, he worked for the Overseas Development Institute in London and has experience in human rights research and coordination in Afghanistan, India, Pakistan, and Nepal. He holds an MSc from the School of Oriental and African Studies, and MA from Jawaharlal Nehru University, and a B.A. from Bard College at Simon’s Rock.